Explanation: As the robot Cassini spacecraft rounds Jupiter on its way toward Saturn, it has taken a sequence of images of the gas giant with its four largest moons. Previously released images have highlighted Ganymede and Io. Pictured above are the two remaining Galilean satellites: Europa and Callisto. 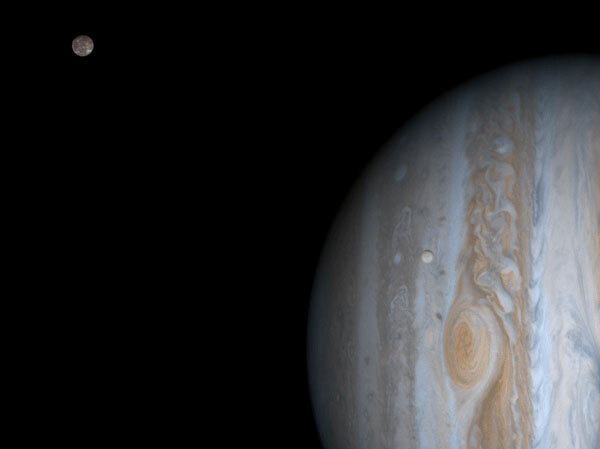 Europa is the bright moon superposed near Jupiter's Great Red Spot, while Callisto is the dark moon near the frame edge. Callisto is so dark that it would be hard to see here if its brightness was not digitally enhanced. Recent evidence indicates that both moons hold salt-water seas under surface ice that might be home to extra-terrestrial life. By noting the times that moons disappeared and reappeared behind Jupiter in 1676, Ole Roemer was able to make the first accurate estimation of the speed of light.